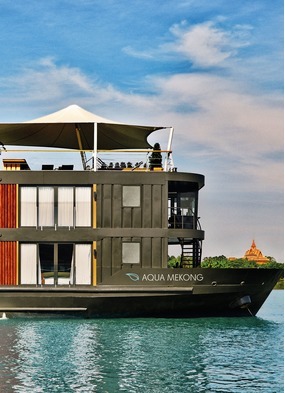 When we talk about Mekong river cruises, we usually mean the Lower Mekong from Cambodia down to the delta in Vietnam. 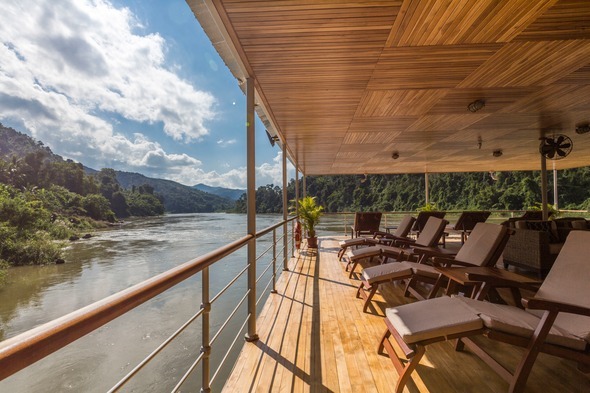 But it's also possible to cruise on the Upper Mekong in Laos, Thailand and China, a very different experience that has plenty to tempt adventurous travellers. 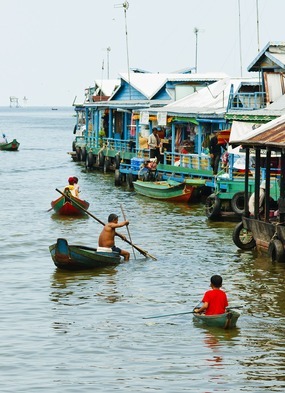 A cruise along the Lower Mekong is primarily about the human activity on the river - the floating villages and markets, the fish farms and barges heaped with sacks of rice - but the northern reaches are much more scenic. 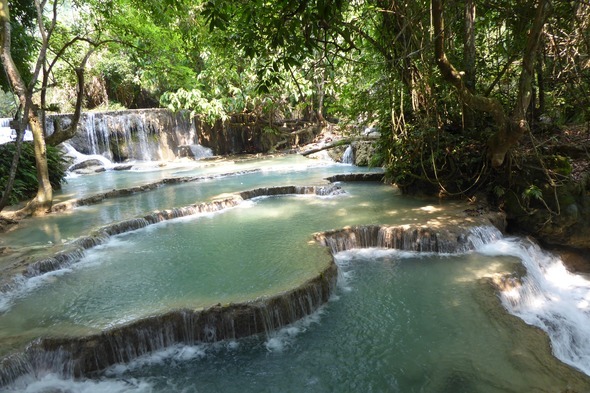 In Laos the river is narrower and faster, flanked by stunning mountain scenery, and the water eddies and swirls over rocks and rapids. 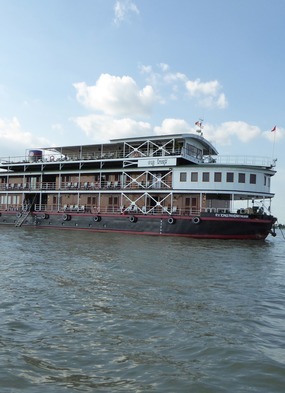 Cruising on the Upper Mekong is a real adventure, and it's not unknown for ships to get temporarily stuck as they negotiate the trickier stretches of the river. The human footprint is also much lighter here, with very little river traffic, the settlements sparse and spread out. You'll see buffalo grazing on the river banks, the occasional farmer, and the tell tale scorch marks of slash and burn agriculture higher up on the slopes. Going ashore often involves scaling a sandbank or a bamboo staircase to reach a remote village where the people live a simple life, and you'll have the chance to learn about the diverse tribal groups that live along the river. 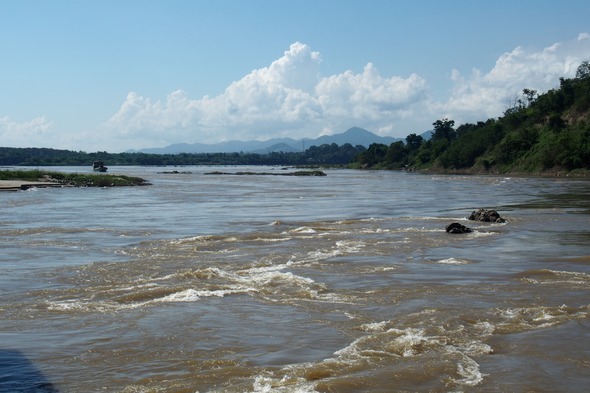 So how can you travel along this part of the Mekong? Locals tend to zip down the river on small and uncomfortable speedboats, while the slow boats that ply the route between Chiang Khong and Luang Prabang offer a more enjoyable experience for tourists. This is how I travelled on my recent trip to Laos, with an overnight stay at a lodge in Pakbeng, the halfway point. 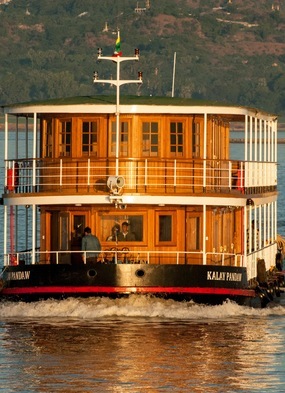 But the very best way to cruise the Upper Mekong is with Pandaw River Expeditions, on board one of their beautiful colonial-style river vessels. 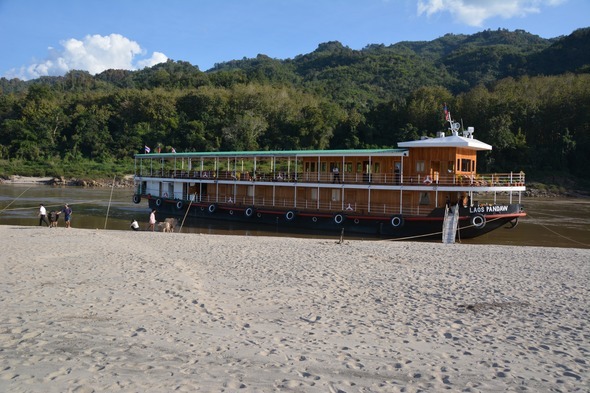 Pandaw offer two different itineraries on the Upper Mekong: you can focus on Laos with a 10-night cruise between the Thai border town of Chiang Khong and the Lao capital, Vientiane, or you can venture into China with a 14-night itinerary between Luang Prabang and Jinghong. 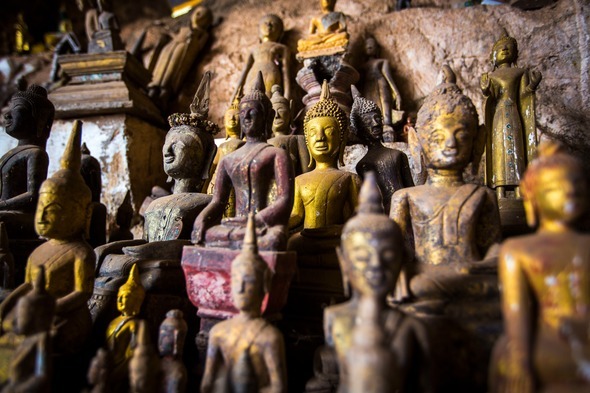 Both itineraries include visits to local Lao villages, the gilded temples of Luang Prabang and the atmospheric Pak Ou Caves, filled with hundreds of Buddha statues. 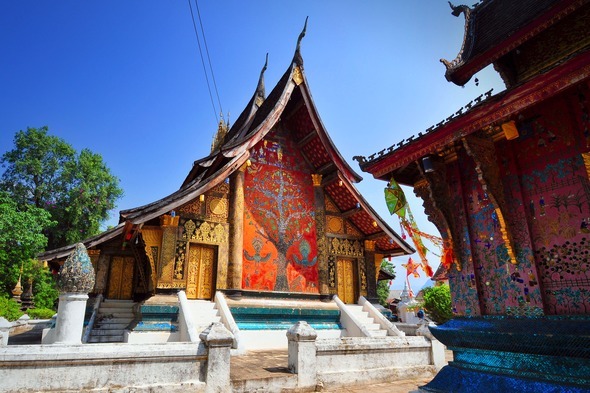 Opting for the stretch between Chiang Khong and Vientiane allows you to add on some time in northern Thailand, perhaps visiting the stunning temples of Chiang Mai or trekking amongst the hilltribes of the Golden Triangle. However, this itinerary only gives you two nights in Luang Prabang, and for me that is a real shame, as it's my favourite city in the world. 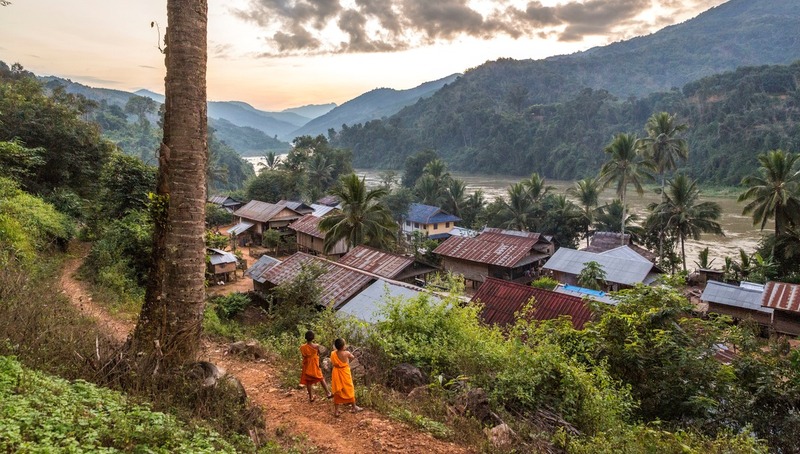 I would recommend at least three nights in Luang Prabang, which allows you time to explore the many beautiful Buddhist temples, get up early to witness the traditional alms giving ceremony, and spend some time sampling the excellent restaurants on offer. You'll also have time to visit the spectacular Kuang Si Falls, just outside the city, and I would highly recommend a visit to MandaLao, an ethical elephant sanctuary where instead of riding these magnificent creatures you walk alongside them, feeding them bananas and learning about their behaviour from the superb guides. 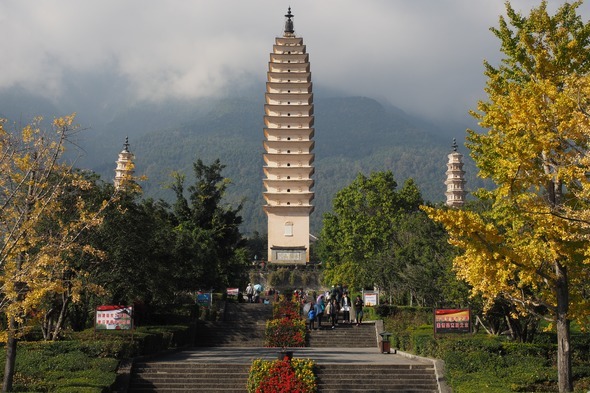 The 14-night cruise will take you beyond the northern borders of Laos and on to the rarely visited Chinese stretch of the Mekong, with the option to add on a pre- or post-cruise tour of Yunnan province, home to the fascinating cities of Lijiang, Dali and Kunming. The Upper Mekong is a unique river cruise destination, a great option if you've already cruised on the Lower Mekong or you're looking for an alternative to Burma in light of the country's recent political troubles. This is also a part of the world that is changing fast, with Chinese investment in new dams and railways transforming the wider Mekong region, so now is the time to visit.